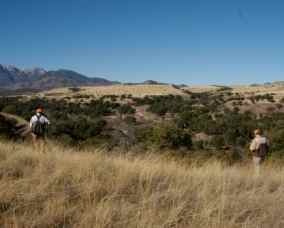 Many hunters, anglers and other outdoor recreationists have been wondering how the current federal government shutdown, which began Oct. 1, will impact their upcoming outings. Despite closures by federal land management agencies of their administrative offices and some controlled access points and facilities, there are numerous opportunities available to Arizonans for outdoor recreation. Please keep in mind that, with regard to federal lands, official information on closures is the responsibility of the respective federal land management agencies. The Arizona Game and Fish Department is providing this unofficial update as a service to constituents based on the best information we have available at this time, and that information is subject to change. Lake Pleasant. The striper bite at this lake northwest of Phoenix is one of the state's best right now. This is a great boating lake as well. Lake Pleasant Regional Park is under the jurisdiction of Maricopa County. Lake Havasu. It's an ideal time to visit this 19,000-acre impoundment in western Arizona that's a haven for stripers, largemouth bass and smallmouth bass. It's very popular with boaters as well. Most of the busier launch sites remain open, and Havasu is a community that welcomes and caters to anglers. For more information, visit Lake Havasu Website and see how to "Play like you mean it." Alamo Lake, a 3,500-acre impoundment northwest of Wickenburg, is particularly excellent for largemouth bass, crappie and catfish. Urban Fishing Program waters in Phoenix, Tucson and Payson are excellent for fishing. Fall catfish stockings have resumed at the Phoenix and Tucson Urban Fishing Program lakes, and those lakes are being stocked again with channel catfish this week (Sept. 30-Oct. 5). Community Ponds in Yuma, West Wetlands Park Pond, Fortuna Pond, Redondo Pond and the Council Park Pond in Somerton also are sure-fire fishing bets. In the Tucson area, Cluff Ranch, Roper Lake, Dankworth Pond and Patagonia Lake all remain open and are viable fishing options. Around Cottonwood, anglers can head to the lagoons at Dead Horse Ranch State Park, as well as to the Verde River. The striper bite has picked up in the Colorado River below Davis Dam, in the Big Bend area. Although Forest Service boat ramps are reportedly closed at Roosevelt, Apache, Canyon, Saguaro and Bartlett lakes, walk-in access is reportedly open at those lakes and on the Lower Salt River. Also, privately operated marinas and their launch facilities on those lakes are currently open, but some may involve fees. Call ahead to confirm. Boat ramp access to most lakes on Forest Service lands on the Mogollon Rim and in the White Mountains reportedly remains open at this time, but in the event this changes, walk-in access should still be available. Developed campgrounds and associated infrastructure (restrooms, trash containers) may be closed. Mogollon Rim creeks such as Tonto Creek are open, and fishing for trout in the fall can be excellent. Dispersed camping is still available on undeveloped sites. Arizona state parks, such as Lyman Lake State Park near St. Johns, Fool Hollow Lake in Show Low, and Patagonia Lake near Nogales are open for camping and fishing. All Arizona Game and Fish Department offices, shooting ranges, fish hatcheries, wildlife areas, and other department facilities and properties will remain open during their normal business hours. This is the most current information we have as of the time of this communication. Please use it as a guide, not a definitive listing. Also, it's important for boaters and anglers to remember that, under Arizona law, individuals who take their boats out of waters designated as having aquatic invasive species must clean, drain and dry. This means wiping down your boat, pulling your plug and drying your watercraft and equipment for at least five days before launching your boat into a different body of water. In particular, more boaters and anglers may be using Lake Pleasant during this time, and it's imperative that they clean, drain and dry their boats to help prevent the spread of quagga mussels to non-infested waters. Other quagga-infested waters are Lake Powell, Lake Mead, Lake Mohave, Lake Havasu, and all lower Colorado River waters to the international border with Mexico. These waters are listed in the Arizona Game and Fish Department's Aquatic Invasive Species (AIS) Director's Orders located at www.azgfd.gov/ais. For more information on how federal land management agencies are dealing with the federal government shutdown, visit How Federal Land Management Agencies are dealing with the federal government shutdown. Updates will be posted at www.azgfd.gov/h_f/govt_closures.shtml as they occur.